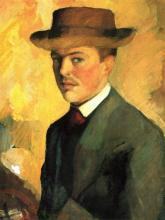 August Macke (January 3, 1887 – September 26, 1914) was one of the leading members of the German Expressionist group Der Blaue Reiter (The Blue Rider). 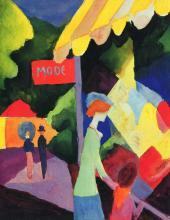 He lived during a particularly innovative time for German art which saw the development of the main German Expressionist movements as well as the arrival of the successive avant-garde movements which were forming in the rest of Europe. 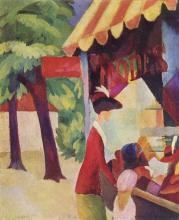 Like a true artist of his time, Macke knew how to integrate into his painting the elements of the avant-garde which most interested him. 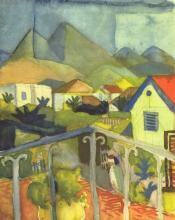 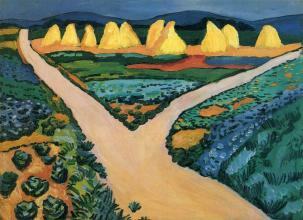 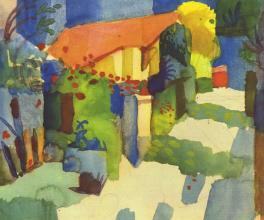 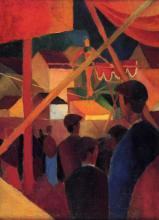 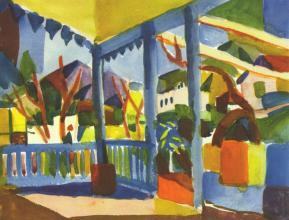 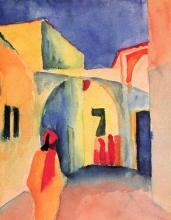 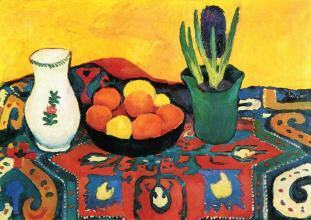 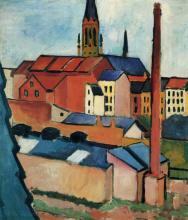 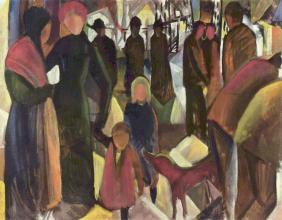 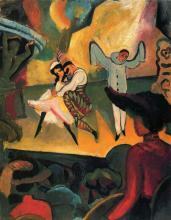 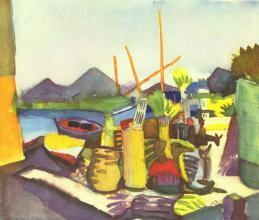 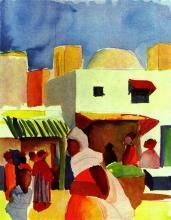 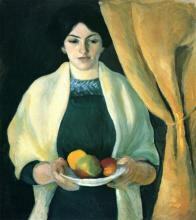 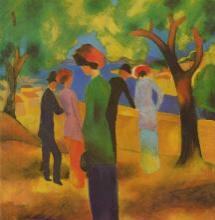 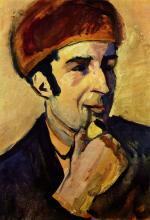 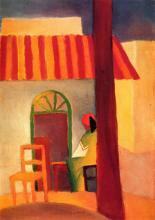 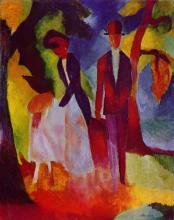 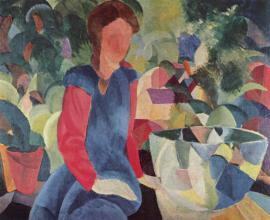 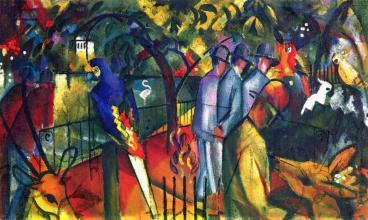 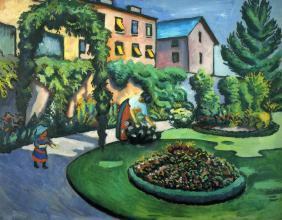 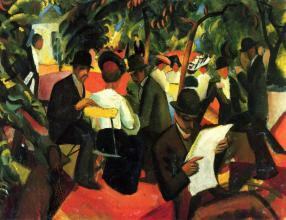 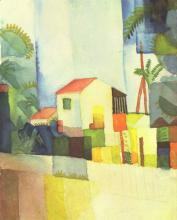 Macke was born in Meschede, Germany. 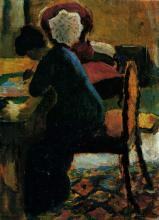 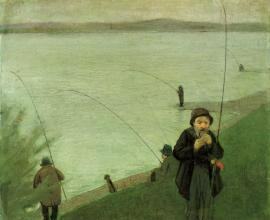 His father, August Friedrich Hermann Macke (1845-1904), was a building contractor and his mother, Maria Florentine, née Adolph, (1848-1922), came from a farming family in Germany's Sauerland region. 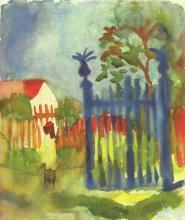 The family lived at Brüsseler Straße until August was 13. 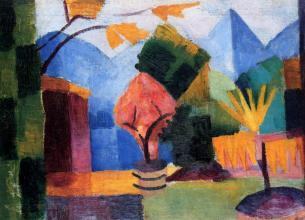 He then lived most of his creative life in Bonn, with the exception of a few periods spent at Lake Thun in Switzerland and various trips to Paris, Italy, Holland and Tunisia. 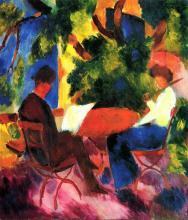 In Paris, where he traveled for the first time in 1907, Macke saw the work of the Impressionists, and shortly after he went to Berlin and spent a few months in Lovis Corinth's studio. 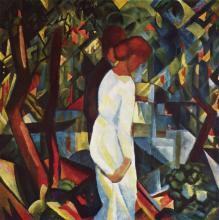 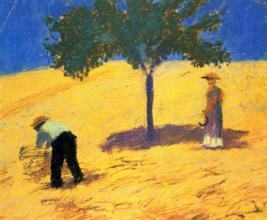 His style was formed within the mode of French Impressionism and Post-impressionism and later went through a Fauve period. 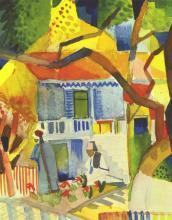 In 1909 he married Elizabeth Gerhardt. 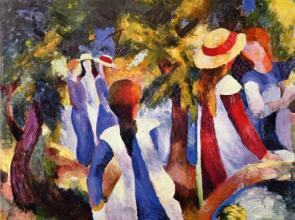 In 1910, through his friendship with Franz Marc, Macke met Kandinsky and for a while shared the non-objective aesthetic and the mystical and symbolic interests of Der Blaue Reiter. 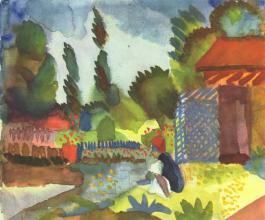 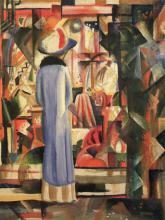 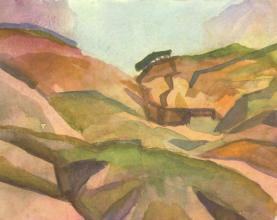 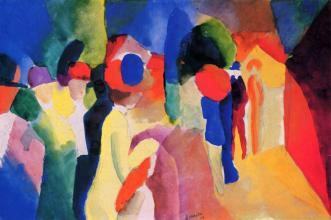 Macke's meeting with Robert Delaunay in Paris in 1912 was to be a sort of revelation for him. 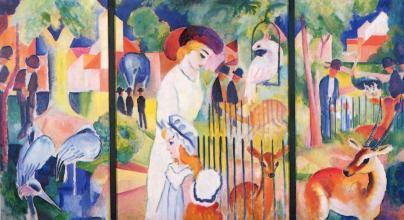 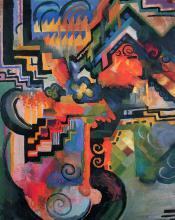 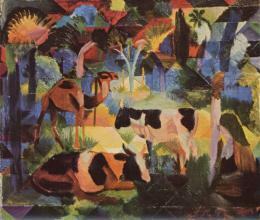 Delaunay's chromatic Cubism, which Apollinaire had called Orphism, influenced Macke's art from that point onwards. 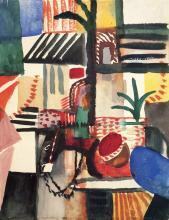 His Shops Windows can be considered a personal interpretation of Delaunay's Windows, combined with the simultaneity of images found in Italian Futurism. 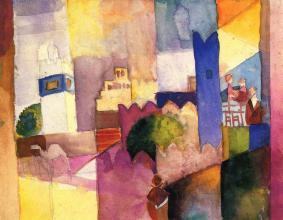 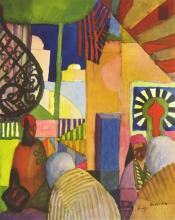 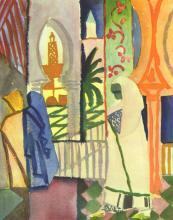 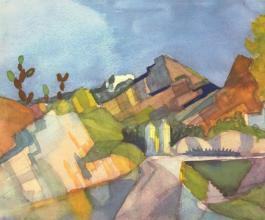 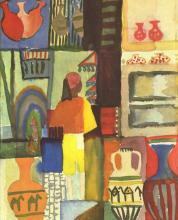 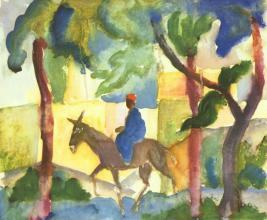 The exotic atmosphere of Tunisia, where Macke traveled in 1914 with Paul Klee and Louis Moilliet was fundamental for the creation of the luminist approach of his final period, during which he produced a series of works now considered masterpieces.